W.B. Yeats wrote a poem about "The Ragged Wood", and walking through the copse at the height of summer, it's apt to use the description for the forest floor at this time of year. The vegetation looks dark green and grey, not the vibrant greens of spring, as the light is stolen by the high tree foliage at the top of the canopy. The parsley and the spring vegetation has died back and their "ragged" look suggests a time of succession, as the only thriving plant is the shade-loving ground growth of the copse floor. The paths are baked hard as concrete, the tree roots stand proud to trip up joggers and cyclists (be careful! ), the constant mud of autumn and winter relegated to a distant memory. The upper path, near the top, is almost consumed in high-growing nettles and brambles; this will need our attention in the coming workdays. But the insects thrive, despite the recent wet days, and feed the birds that are gorging themselves, having reared their nests, and, exhausted, are now feeding greedily, as the season reaches its peak. We recently discussed how many people actually visit the copse, and how popular this amenity could be. 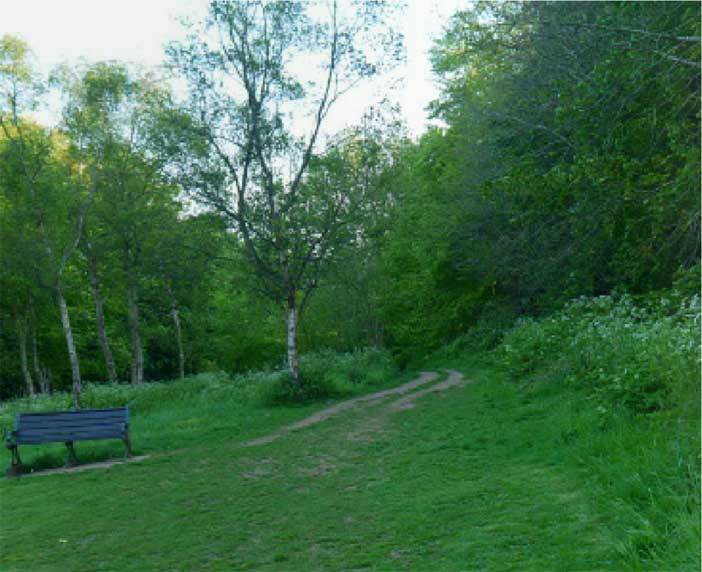 On a walk up and down the copse on a summer's day, within half an hour, we could meet at least a dozen people. There are probably another dozen, whom we do not meet, so as a starting point we could assume there are around 25 people in the copse at any time during the daylight hours. Each visit would hardly last one hour, (since the copse really is a corridor to the South Downs), so let's assume there would be 50 visitors each hour. Extrapolating, this could mean 500 each 10-hour day, or perhaps only 250 in the winter hours, which means a conservative estimate of 9,500 visitors each year would not be unreasonable! But the unmeasurable benefit of the summer hours and the visits to the copse are the social interactions that we have each day. Total strangers become regular acquaintances, particularly among the dog-walkers, and the cyclists always shout a greeting as they climb up the steep path, despite the shortage of breath. Three Cornered Copse as a social amenity is invaluable for connecting with other people. So why not take a stroll through Three Cornered Copse this month, and connect with your neighbours, and enjoy The Ragged Wood.